Brescia University is excited to announce $3,085 was raised this year during the annual Empty Bowls fundraiser at Settle Memorial on April 29. This fundraiser was an opportunity to inform others of the ongoing, though sometimes silent, issue of hunger in our nation and community. Local potters met at Brescia University’s clay studio and made more than 250 bowls to be used for the soup dinner. The cost for dinner was $15, and it included soup, bread, drinks, and dessert. After the dinner, attendees were able to take their handmade soup bowl home. The $3,085 was split between two local churches funding soup kitchens: Woodlawn United Methodist Church and Third Baptist Church. 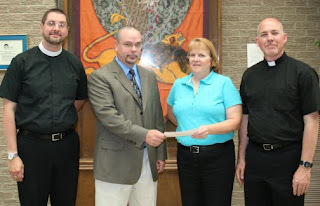 Pictured above from left to right: Jonathan Carroll (Pastor at First Presbyterian), Jim Savage (Pastor of Woodlawn United Methodist), Michele Hartung (local potter), Fr. Carl McCarthy (Pastor of Sts. Joseph and Paul).